We have just dug out a huge clump of false cardamom, Alpinia nutans. We didn’t know this was false cardamom. Our sandy beachside garden had nurtured the glossy, fragrant clump to the point where it became a major blockade and fragrant as the leaves were, it really only flowered – spectacularly – once or twice. The seeds did not resemble the lovely green ones I had come to associate with Indian cookery. According to Jerry Coleby-Williams, (jerry-coleby-williams.net/2013/02/17/seeking-true-cardamom/) nurseries sell false cardamom as the real thing, but if you really want to grow Elletaria cardamomum (true cardamom), you need to buy the seeds from a health food store and propagate from scratch. Alpinia nutans however does provide a great border plant in our challenging wetlands microclimate – sandy and dry one minute and swimming in water the next. Digging out the offending plant was another thing altogether. This shallow rooting plant, part of the ginger family, happened to be planted right on top of the outlet pipe from our water tank. The roots resembled gnarled, arthritic joints, clumping into a mass, which resisted any attempts to break up with fork or spade. The soil however was sandy and relatively moist from recent rain and once the extraction commenced, the roots broke off and eventually the whole plant was uprooted leaving beautifully composted and loose soil. The root ball minus the leaves filled the whole of our green bin, waiting for this week’s collection from the Council. One of the many pawpaws, which emerge in our garden from compost was planted in its place in a flash. We hope it will grow into the one which fell over last year. Meanwhile, I will attempt to propagate real cardamom from real seed. The seeds of the cardamom plant are large and pale green and when ground form a spice often used in Indian cookery, both savoury and sweet. Elletaria cardamomum is native to India and other sub-continent countries and my first experience of the spice was tasting a wonderful sweet called burfi, which was prepared by our host in Bangalore, southern India. Mrs Shetty or Auntie as we were asked to call her, our friends’ mother, did not speak English but allowed us to watch her and her daughters preparing the family meals. 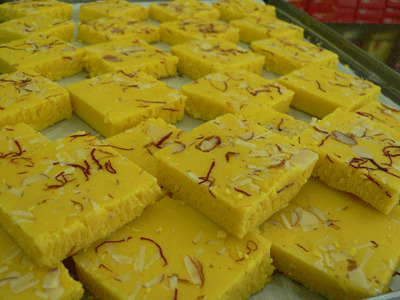 One of her dishes was Burfi, eaten with the ever present chai or tea. According to Madhur Jaffery in her recipe book, Eastern Vegetarian Cooking, Indian sweets are made from Chhena, a fine grained fresh cheese, which is made by souring milk with lemon juice, separating the curds, which, when drained, are kneaded into a ball. Burfi is made from Chhena, adding extra milk or cream, sugar and cardamom fried together to make a thick type of milk fudge, often decorated with pistachio nuts. Madhur calls her Chhena recipe ChumChum (Diamonds) or Dilbahar (hearts) depending on the shape and adds semolina to the mix. The cardamom just lifts the heavy sweetness of this dish and makes it taste delicious.